Can you please advise whether you can supply cartridges for the Lexmark CX310DN printer with larger output volumes? I'm looking maybe for a black that does 6,000 pages and colours that do 4,000 pages. The only ones I can see on the website cover 1,000 pages. Please advise? Unfortunately, the Lexmark CX310DN colour laser printer doesn't accept toner cartridges with capacities as high as this. We only stock the 1,000 page cartridges for the Lexmark CX310DN printer at this time. This is a more affordable network-ready device when compared to its predecessors, and it offers multifunctional capabilities like scan and copy, as well as high speed printing for low to mid-volume output. The Lexmark network-ready CX310DN MFP is easy-to-operate, and users can print high quality colour graphics, too, but there are a few missing features that could compromise its overall efficiency. There is a 50-sheet ADF and built-in two-sided printing. Up to three paper cassettes can be installed into the Lexmark CX310DN printer. Users can print on different types of media including card stock, labels, and transparencies. The Lexmark CX310DN colour laser printer is also praised for quiet operation, fast print speeds (up to 23ppm), and the user-friendly panel. Colour replacement technologies and PANTONE calibration help improve the quality of colour graphics. The all-in-one Lexmark CX310DN laser printer features Unison Toner technology for superior image quality. It is heavy, weighing 27.39Kg, and it needs more installation space because of its 558mm long frame with the front-access paper cassette. The CX-310DN multifunction printer does not have direct USB capabilities and there are no options to integrate a hard disk drive for added security features and document storage. 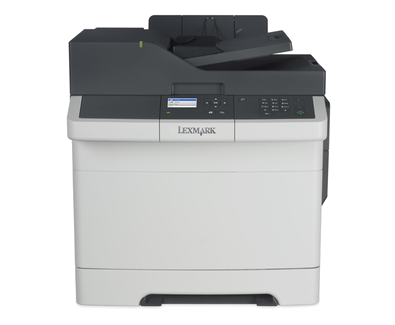 The expandability options of the Lexmark CX310DN MFP are very limited and not suitable for the growing office.